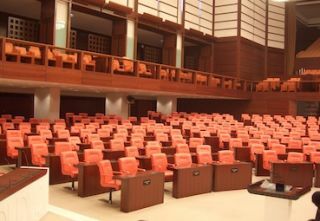 The Grand National Assembly of Turkey—generally known as the Turkish Parliament—recently upgraded the microphone system in its Main Hall, located in the capitol city of Ankara. For the massive project, the Parliament’s technical department called upon installer/distributor Elektrosonik Ltd., which in turn suggested JTS Microphones. The Parliament’s needs were such that custom-built gooseneck microphones were required for the site. Prototypes meeting the technical department’s specifications were created over the course of a few weeks, and were soon installed in the Main Hall for a trial run. Upon approval, the rest of the microphones were manufactured within a month and placed in the facility. JTS states its “high quality and relatively low unit price” sealed the deal, and to date, more than 1,000 gooseneck microphones have been sold to the Turkish Parliament’s technical department.